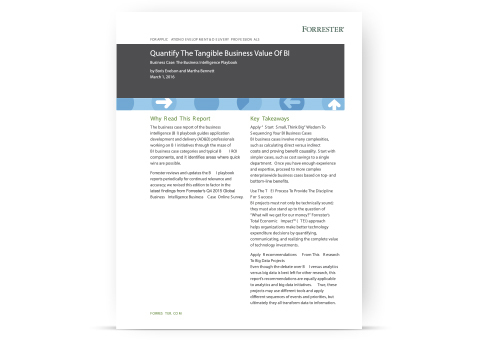 Forrester helps you quantify the business value of BI. If you’re weighing the potential business benefits of business intelligence solutions like analytics, take a look at Forrester Research’s January 2015 report Quantify the Tangible Business Value of BI. This report provides a roadmap of in-depth recommendations on what can be a costly and complex decision. Don’t miss this essential touchpoint for the sensible implementation of any BI solution.